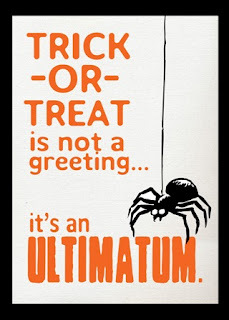 The Spooky Vegan: 31 Days of Halloween: Wishing You a Happy Halloween! 31 Days of Halloween: Wishing You a Happy Halloween! The time is nigh, ghouls and boils! It's finally Halloween!! I've been waiting and preparing for this day all month long (thank you for celebrating with me during my 31 Days of Halloween! ), but now that it is here it is definitely a bittersweet feeling. I'm overjoyed that today is my most favorite holiday, but at the same time I'm sad because I know that Halloween season is drawing to a close. Of course, I have next year to plan for, but over the next few weeks I'll be going through Halloween withdrawals, like many of you other Autumn people out there. Symptoms include hoarding of all candy corn and pumpkin-flavored edibles, repeated viewings of The Nightmare Before Christmas (hey, it helps to ring in the Christmas season! ), slowly taking down decorations (while sobbing a little...in fact this usually makes me so sad that I purposely leave what some might consider "Halloween" decorations up year-round), trying to preserve jack-o-lanterns for as long as possible and a general malaise that lingers for the first few weeks of November. But enough doom and gloom...it's Halloween and let's enjoy this most ghoulish holiday! Since Halloween falls on a Monday this year, it will be a low-key Halloween night with just me and Mister Spooky (we attended a friend's Halloween party over the weekend). 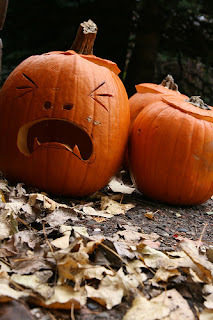 We are planning on carving pumpkins and watching some classic horror movies. I'm thinking viewings of Dracula, The Wolf Man and Frankenstein are in order. We also might watch some Halloween horror movies, like Halloween and Trick 'r Treat. We never get any trick or treaters, but just in case we have a big bowl of Halloween candy (Sour Patch Kids, Nerds, Twizzlers, Swedish Fish...pst! They are all vegan!) for any stray spirits that show up on our doorstep. What are you doing tonight? I'd love to hear what you have planned for this eerie evening in the comments below! Your night and my night sound very similar. I threw a dinner party last night, but plans for my darling Yetch and I this evening are looking like the two of us, curled up on the couch, watching horror movies. We may head out to see a friend's haunted yard, but that will probably be the most exciting event of the night. Like you, I find it terribly depressing to take it all down, and also like you, I leave bits and bobs out all year. My plans involve sitting on my doorstep greeting likely 150 trick-or-treaters. And then eating any leftovers. Happy Halloween! Thanks for including a pic of my favourite couple, Morticia and Gomez! It just wouldn't be Halloween without them! Pumpkin carving and a movie are on the agenda for me, too!! I plan on going out, getting food, then coming home to watch a creepy movie. Plus, I like skulls, so any I can have out and around, I will have out.